I was a conflicted Baptist. I grew up in a large, metropolitan church in Houston, Texas that gifted me with many people who supported me and encouraged me as an individual. There were, however, unspoken rules about my future role in Church ministry because I was a female. I understood that I was choosing a difficult path and would have to walk a narrow line, but I knew that God was calling me to some type of full-time ministry. Then I came face to face with Baptist history of the 20th Century during Seminary. My boat was overturned in a storm of internal conflict. I was learning about the Cooperative Baptist Fellowship, and gender equality in ministry while trying to sort out what I believed about how God created me and to what purpose he had gifted me. This new way of ministry became incarnational for me in the summer of 2013. That summer I went with a team to West Yellowstone, Montana with the Collegiate Congregational Internship (Student.Church). There, I preached my first sermon, served communion, lead worship, spoke at a funeral, and performed a marriage vow renewal ceremony. I also worked a part-time job and spent time hanging out with my co-workers. I found bi-vocational ministry to be very life giving. The most important part of that summer for me was all of the support, encouragement, and confidence that the Church, my team, the pastor, and the director of Student.Church provided me. That was the first time I had ever truly been affirmed as a female minister and it changed my life. I was no longer an oddity, or trying to navigate through negative opinions about my position. I truly felt grafted into the bigger story of women in ministry. I learned from those who paved the way before me, and truly learned what Isaac Newton meant when he said, “If I have seen further than others it is by standing upon the shoulders of giants.” I am so grateful for the legacy and continuing work of my fellow ministers who go out of their way to further the cause of young clergy. As I was finishing seminary and searching for my next opportunity, I began looking for holistic ministry jobs that would enable me to engage the community outside of the traditional church walls. The CBF network that exists to connect and network young ministers lead to me hearing about an opportunity in Charleston, South Carolina with Metanoia, a faith-based community development organization started by the South Carolina CBF Churches. Metanoia focuses on finding the strengths, or assets, in neighborhoods and using them as building blocks for eventual success. The holistic work they do alongside the community was exactly what I wanted to be involved in. Their methods of making positive change in the world in order to look like the Kingdom of God spoke directly to God’s calling and gifting on my own life. I began working with Metanoia’s Leadership Academy in August, and I am so grateful to be a part of an organization that celebrates the dignity and personhood of all people created in the image of God, while taking real steps to incarnate the love of Christ here and now in their daily lives. CBF has been a place of learning, fellowship, encouragement, and personal growth since they first welcomed this conflicted Baptist with open arms. I am no longer a conflicted Baptist. I choose to be a CBF Baptist because of the network of support, encouragement, and opportunity that I have experienced firsthand. CBF has been a valuable network in my life for formation and partnering in renewing God’s world. 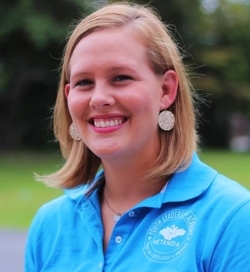 In addition to serving as the Elementary Coordinator for the Metanoia Youth Leadership Academy in Charleston, S.C., Lizzy Bauman is a graduate of George W. Truett Theological Seminary at Baylor University in Waco, Texas. This column is part of a yearlong series sponsored and hosted by the Baptist History & Heritage Society, one of the Fellowship’s partners, exploring and celebrating why young Baptists identify with the Cooperative Baptist Fellowship. Thank you for encouraging other women who are Baptist and seek to become full-time ministers as well. Your testimony strikes at the very heart of why I also am a CBF Baptist and I look forward to following young people such as yourself and the transformation that occurs to the organization as we realize the “all inclusiveness” of Christ.